Watches from Audemars Piguet and Patek Philippe are often found somewhere near the top of many watch collectors "Grail lists". These two titans of time have created hundreds of majestic timepieces yet what is it about the Audemars Piguet Royal Oak and the Patek Philippe Nautilus that separates them from the rest? Why have their designs lasted over the last forty years yet are still as stylish as ever? In talking about these two watches one must first discuss the man who brought them into the world, Mr. Gerald Genta. Any industry veteran reading this will know exactly who Gerald Genta is and why he is considered so important to the watch industry; but for those that are just getting started in watches it is worth taking a look at this extraordinary individual. Born May 1st 1931 in Geneva, Gerald Charles Genta was a talented artist from a young age and despite his parents wishing for him to pursue a more conservative career he spent much of his youth with paintbrush in hand. For all his life Genta would be a free spirit unwilling to be subordinate to any man and started off his career as a freelance artist selling designs for 15 Swiss Francs each. When he was just twenty three years old he was contracted by Universal Geneve to design a watch to honor the first commercial flight over the North Pole. The Polerouter was one of Genta's earliest and biggest successes and was also the first wristwatch to be fitted with a micro-rotor. Compared to his future work, the Polerouter stands alone in the majority of Genta's catalog. The case and bezel are more traditionally shaped compared to the octagonal motif that would develop over the course of his career. The Polerouter has gently sloping long lugs rather than the short stubby ones that would integrate case and bracelet in the Nautilus and Royal Oak (Genta would later design the White Shadow for Universal which does have his trademark short lugs and curved case). How much freedom a young Genta had when designing the Polerouter is undetermined so perhaps his octagonal desires weren't accommodated for. On the other hand at this very young age maybe he had not yet discovered his signature style. Regardless, the Polerouter is one of the most beautiful watches in the Universal Collection and is certainly in my grail list. 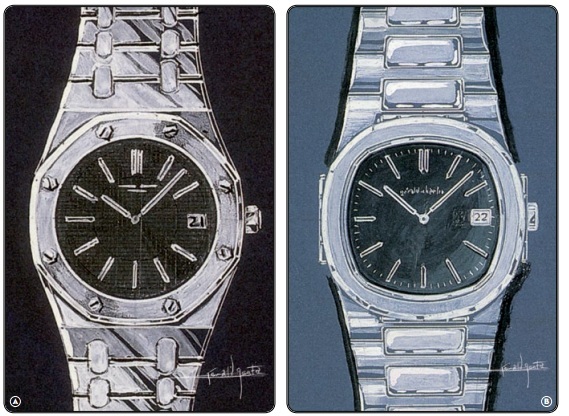 Genta's early design of the Royal Oak. In the coming years Genta would design many watches for a variety of companies. Working with Omega's supplier he aided in the design of the Seamaster and Constellation, since 1953 he had been collaborating with Audemars Piguet on a variety of watches and in 1968 he designed the Patek Philippe Golden Ellipse. One year later he started his own watch brand Gerald Genta and transformed an unused LeMania factory into his workshop, which the locals would dub "The Candy Factory" after the bright pink coat of paint Genta covered the building with. On a quiet afternoon in 1970 he got a call that would end up changing the face of luxury watchmaking forever. The managing director of Audemars Piguet, Mr Georges Golay, called Genta and told him that "I need a steel sports watch that has never been done before. I want it to be something totally new and waterproof". Not only did Mr. Golay task Mr. Genta with creating something that had never been seen before, he wanted it done by the next day. His impatience is understandable as Audemars Piguet was on the verge of bankruptcy and with the release of the battery powered Seiko 35SQ Astron a year prior, the Quartz Crisis was looming large over Switzerland. After hanging up the phone at 4 o'clock in the afternoon, Gerald sat down at his table and didn't get up again till the next morning when he had completed the preliminary sketches of what would become the Audemars Piguet Royal Oak. What he had produced was a sports diving watch with a raised octagonal bezel attached to the case with eight very visible screws with an integrated bracelet flowing right into the case. Genta himself said that his intention was to replicate the helmet of a deep sea diver. 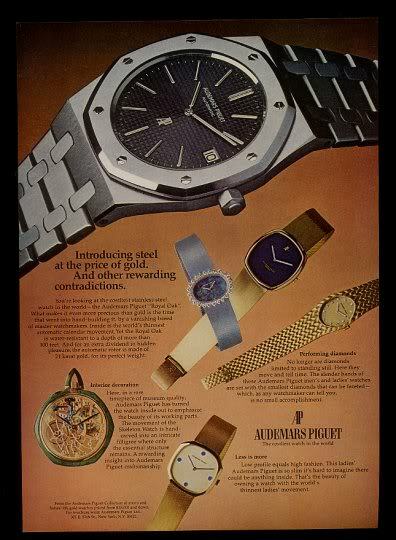 This steel beast was a world apart from what Audemars Piguet was known for as the company had focused solely on conservative gold dress watches for much of it's ninety five year history. When shown the designs, Mr. Jacques-Louis Audemars (AP remains the oldest watch company to be owned by the founding family) was apparently horrified however this did not stop him from signing a contract with Genta for the exclusive rights to the design. Genta would spend the next year attempting to create the design with AP watchmakers who believed the design was impossible to produce with the dial alone taking 18 failed attempts before succeeding. After seeing the prototype (which ended up in Gerald Genta's private collection) George Golay ordered an initial run of 1000 watches ready to go to market in 1972. Whilst 1000 might seem a small number for worldwide distribution at the time Audemars Piguet was only making around 5800 watches a year making this a huge gamble. The integrated bracelet was made by Stern Freres and the repeating pattern of two vertical connecting links on the tapered brush bracelet would become iconic in its own right. Unfortunately the bracelets were made very thin so were prone to stretching, leaving those pieces in good condition today commanding very high prices. In addition to this as Audemars Piguet did not produce the A series bracelet there are no original spare links or bracelets. The name Royal Oak was not conjured up by chance but influenced by the watches nautical themed design. Over the course of three hundred and fifty years there have been eight ships in the British Royal Navy that have been called HMS Royal Oak named after the oak tree that Charles II hid in during an escape from parliamentary forces. 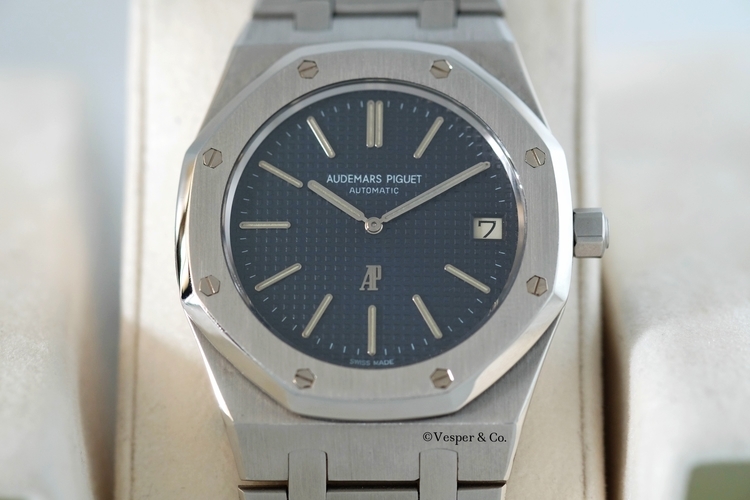 On the outset it seemed doubtful that this new Royal Oak would be a similar saviour to Audemars Piguet as it took over twelve months to sell the first 1000 A series to retailers. Those that saw the watch were horrified by it's enormous size (39mm) and the extortionate cost of 3200 Swiss Francs, far more than the gold watches of the time. This prompted outcries that "for the price they could have at least hide the screws!". In comparison the Rolex Submariner was only 280 Swiss Francs at the time. No-one was able to understand why a steel watch was so costly despite AP's reasoning that the cost was due to the intense labour of constructing the watch rather than the material. Whilst the Royal Oak was an iconic steel watch, the first one sold was actually made in white gold specially for the Shah of Iran. There is a tale that he had to return the watch to AP after he went swimming and it filled up with watch as insertion of rubber seals had been neglected during manufacturing. Slowly but surely the market warmed to the Royal Oak and a second A series was commissioned and subsequently a B & C. There was a popular rumor that a very rare run of "Pre-A" Royal Oaks were made however Benjamin Clymer went on the record dispelling the rumor as false. The confusion came from the less popular two-tone Royal Oak Ref. 5420SA which was not produced with an A before the serial numbers unlike the steel Royal Oak Ref. 5402ST. The Patek Philippe Nautilus was born as a reaction to the huge change that the Royal Oak brought about in the industry. Patek wanted a watch that would keep their ethos of tradition and elegance alive yet would still feel contemporary so they turned to their previous collaborator, Mr. Gerald Genta. Now if Genta himself had not have repeated the following story in an interview I would never have believed it. Whilst in a Basel restaurant Genta noticed a group of Patek employees eating on the other side of the room. Turning to his waiter and requesting a piece of paper and a pencil, he sketched out the Nautilus in five minutes right there and then. I can imagine the Genta biopic now, inspirational music softly building to a crescendo as Genta frantically sketches away to the delight of a bemused (Yet suitably intrigued) waiter. Rather than the harsh angular lines of the Royal Oak, the Nautilus was shaped more like a ship's porthole with soft curving edges. On either side of the watch there were two "ears" similar to the latches on either side of a porthole. The name "Nautilus" (Latin for sailor) conjures up thoughts of the submersible commanded by Captain Nemo in Jules Verne's novel "Twenty Thousand Leagues Under the Sea". Whilst the watch was never intended to be a professional divers watch like a Submariner, it did offer 120 meters of water resistance. It is interesting to note that one the original patent filed in 1976 it lists Philippe Stern, then President of Patek Philippe, as inventor as opposed to Gerald Genta who is listed as the creator of the Royal Oak. The Ref. 3700/1A was launched in Baselworld in 1976 and like the Royal Oak it drew criticism for it's size and was nicknamed the Jumbo. Despite the large case size of a whopping 42mm it was extraordinarily slim measuring in at just under 8mm (7.6mm to be exact). The movement inside was exceptionally slim as the rotor moved on a fixed rail around the circumference rather than having a central axis, allowing the rotor to be much slimmer The Patek Calibre 28-255C was infact the same movement as the Royal Oak, AP Calibre 2121, because were based off the Jaeger LeCoultre Calibre 920. Beating at 19.800 bph the 920 is still regarded as the world's thinnest full-rotor automatic movement over forty years after its initial development. Funnily enough JLC never actually used the movement themselves after spending several years making it. 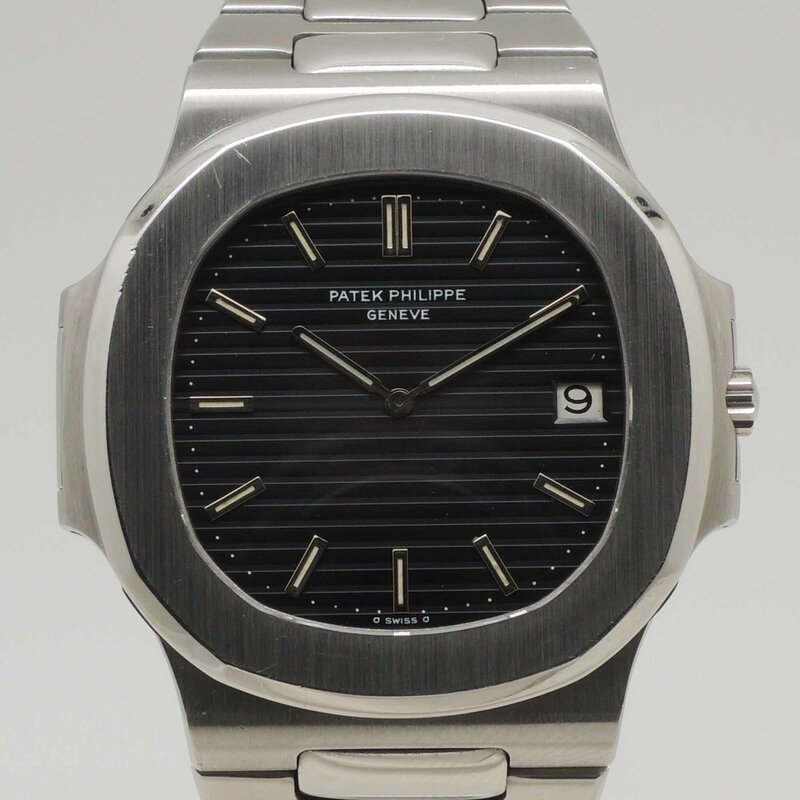 Patek also utilized the services of Stern Freres who made the dials for the original run of the Nautilus. As one would expect of Patek, each of the dials were entirely made by hand with every horizontal groove engraved separately. The dial was painted in alternating coats of blue and black paint to conjure up images of the ocean depths. The long lasting effect of the Royal and the Nautilus in the watch industry cannot be understated. Whilst both AP and Patek still make conservative gold dress watches they have broadened their horizons to more modern and contemporary pieces as a direct result of Genta's designs. The Royal Oak Off Shore stands alone in AP's range as a monster chronograph adored by sportsmen and musicians alike whilst Nautilus bore a child in the form of the Aquanaut. It is true that both these newer lines can be found in precious metals, they never would have existed without Genta's rule breaking designs that were responsible for rethinking luxury in steel. 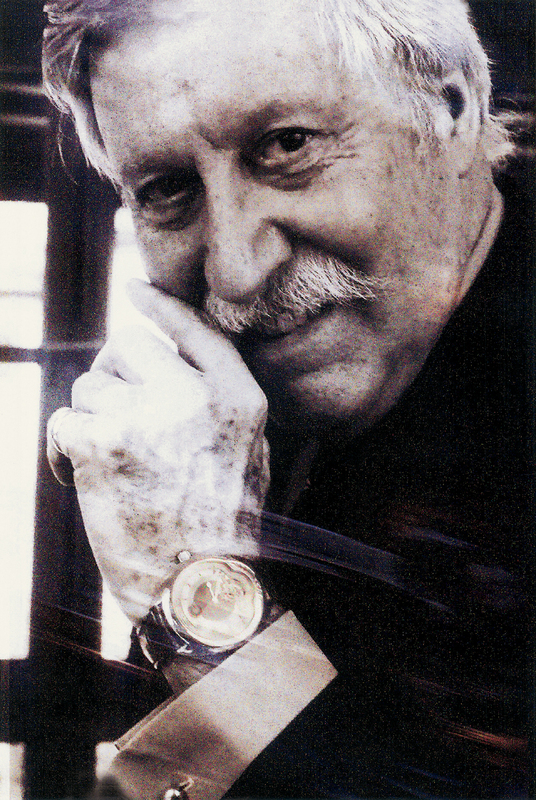 Throughout his illustrious career Gerald Genta was sought after by VIP clients wanting a unique pieces that only he could provide. Age did not dull his talent nor did it change his rebellious nature. Retiring at 65 he sold the Gerald Genta company to the Hour-Glass group however he soon became disappointed in their designs and felt they were sullying his reputation. At the age of 68 he started a new company, Gerald Charles, to show that he knew what was best for the Genta name. In my opinion these newer designs never captured the timelessness of either the Royal Oak or Nautilus with Genta himself saying that whilst he had a Gerald Charles Turbo in his collection he never wore it because it was too uncomfortable. I would not describe the Gerald Charles brand as a failure by any standards however given his huge successes throughout his life, Genta had set the bar very high for himself. Gerald Genta passed away on August 17th 2011. Whilst the legacy of the Gerald Genta and Gerland Charles brands are questionable, it is without question that the work that he did at Omega, IWC, Universal Geneve, Audemars Piguet and Patek Philippe will never be forgotten. I cannot recommend highly enough this interview with Genta which is a wealth of information not only about his designs but the man himself. 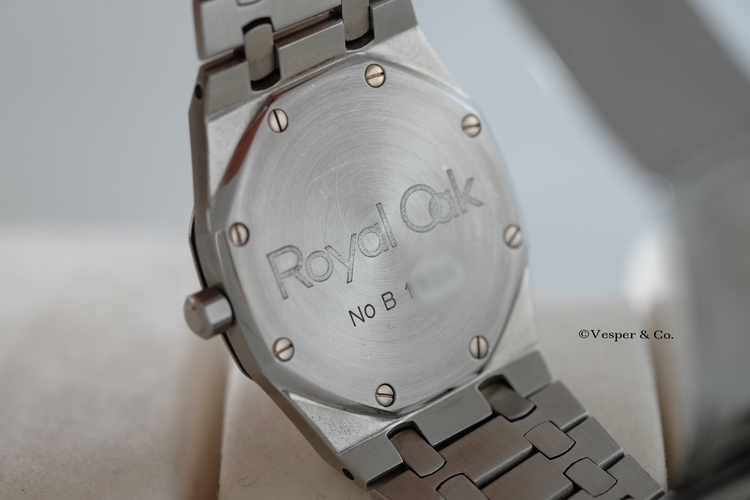 Many thanks to Vesper & Co for allowing me to use their photographs of the B series Royal Oak. If you enjoyed this article why not subscribe to the Timepiece Chronicle newsletter so you never miss out again!